Symptoms: Eyeball looks cloudy and swollen and is protruding. If not treated quickly it can cause blindness and death. Cause: Bacterial infection usually caused by poor water quality. Treatment: Large water changes- minimum 50% – for 3 to 5 consecutive days. If you do not see any improvement within 3 days of consecutive water changes you can purchase fish antibiotics: Neomycin, Kanamycin, or Erythromycin and use as directed. Discus pop eye can be treated successfully if diagnosed early. The discus will have one or both eyes protruding from the head. You may notice that the eyes have a white bubble underneath them. Consequently the entire eye will have a white film over it. The most successful and quickest treatment for this is daily water changes of 50% for 5 consecutive days. As the days go on you will notice less cloudiness in the eyes. I would try to stay away from any kinds of medications with discus fish. Hence, If pop-eye goes untreated it can eventually kill your fish. It’s a bacterial infection that will grow and strengthen if not treated quickly. In my 20+ years of keeping discus I never had a discus die on me as a result of pop-eye. I treated all of them with the daily water change method without any medications. 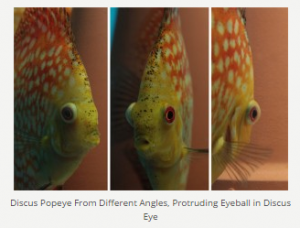 The primary cause of discus pop-eye is poor water quality. Poor water quality contains high levels of nitrogen which is not good for discus fish. As a result consecutive water changes is a sure-fire cure. If you are performing daily water changes and don’t see much improvement it means that you aren’t changing enough of the water. Therefore 50% of the water must be changed daily to treat the infection.